What is cancer robotic surgery? Robotic surgery is a minimally invasive alternative to traditional surgery that uses robotic arms to control superfine tools through small incisions. It can be used to treat many types of cancer. Though a prostatectomy can be performed by “open” (traditional) surgery with a large incision, it can also be performed using the sophisticated da Vinci® Surgical System, which has rapidly become the favored approach worldwide for the removal of the prostate. This system uses a few small incisions and a robotic arm that is controlled by the doctor for greater precision. For complex hysterectomies, pelvic organ prolapse repair and other gynecologic and urogynecologic procedures, robot-assisted surgery with the da Vinci Surgical System may be the most effective, least invasive treatment option. Through tiny, 1-2 centimeter incisions, surgeons using the da Vinci Surgical System can operate with greater precision and control, minimizing the pain and risk associated with large incisions while increasing the likelihood of a fast recovery and excellent clinical outcomes. The da Vinci Surgical System is a sophisticated robotic surgical platform that offers a minimally invasive alternative to complex surgery. It consists of an ergonomically designed console where the surgeon sits while operating, a patient-side cart where the patient lies during surgery, four interactive robotic arms and a high-definition 3D vision system. The skilled surgeon is in control of the robotic platform, and the movements of the surgeon's hands on the controls are translated into movements of the robot. 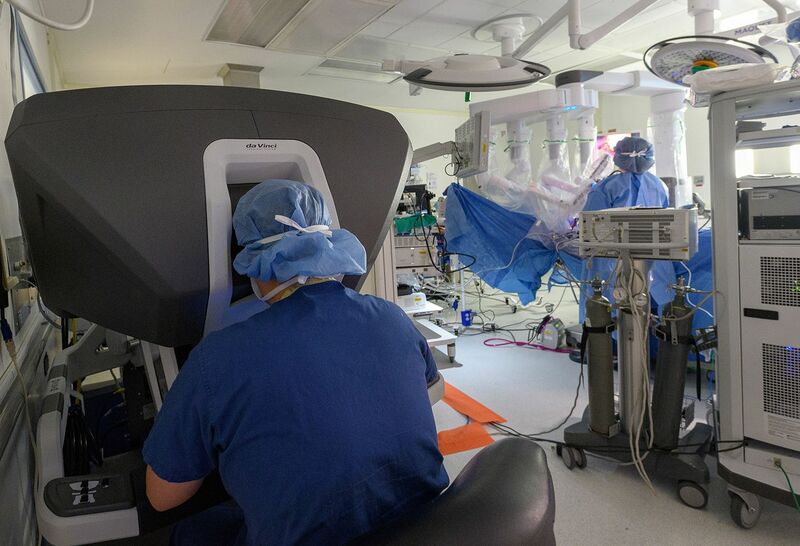 Recognized nationally and internationally for their pioneering work, our robotics-trained surgeons at Northwell Health are at the leading edge of robotic surgery using the da Vinci Surgical System. From robotic heart bypass surgery and prostatectomy procedures to lung and obesity surgery, our surgeons—who specialize in a wide variety of areas including urology, pediatric urology, cardiovascular, thoracic, women's health and general surgery—are proving that the future of robotic surgical procedures is here. Because it requires only a few tiny incisions and offers greater vision, precision and control for the surgeon, cancer patients often experience reduced pain, less blood loss, lower risk of infection, less scarring, shorter hospital stays and faster recovery.